Howdy, particlebite enthusiasts! I’m blogging this week from ICHEP. Over the next week there will be a lot of exciting updates from the particle physics community… like what happened to that 750 GeV bump? are there any new bumps for us to be excited about? have we broken the standard model yet? But all these will come later in the week – today is registration. But in the mean time, there have been a lot of interesting papers circulating about disentangling dark matter from our favorite astrophysical background – pulsars. The paper, which is the focus of this post, delves deeper into understanding potential gamma-ray emission found in dwarf spheroidal galaxies (dsphs) from pulsars. The density of millisecond pulsars (MSPs) is related to the density of stars in a cluster. In low-density stellar environments, such as dsphs, the abundance of MSPs is expected to be proportional to stellar mass (it’s much higher for globular cluster and the Galactic center). Remember, the advantage over dsphs in looking for a dark matter signal when compared with, for example, the Galactic center is that they have many fewer detectable gamma-ray emitting sources – like MSPs (see arXiv: 1503.02641 for a recent Fermi-LAT paper). However, as we get more and more sensitive, the probability of detecting gamma rays from astrophysical sources in dsphs goes up as well. MSP gamma-ray luminosity function (0.1–100 GeV) normalized to the stellar mass of the Milky Way. The shaded gray band represents the 1σ statistical uncertainty on the broken power-law fit to these data and dashed gray lines represent the systematic uncertainty envelope. This work estimates what the gamma-ray flux should be (known as the luminosity function) for MSPs found in dsphs. They assume that the number of MSPs is proportional to the stellar density and that the spectrum is similar to the 90 known MSPs in the Galactic disk (see the figure on the right). It fits the gamma-ray spectrum to a broken power law. We can then scale this result to the number of predicted MSPs in each dsph and distance of the dsph. This is then used as a prediction of the gamma-ray spectrum we would expect from MSPs coming from an individual dsph. They found was that for the highest stellar mass dsphs (Fornax, Draco – usually the classical ones, for example), there is a modest MSP population. However, even for the largest classical dsph, Fornax, the predicted MSP flux > 500 MeV is~ 10−12 ph cm−2s−1 , which is about an order of magnitude below the typical flux upper limits obtained at high Galactic latitudes after six years of the LAT survey, ∼ 10−10 ph cm−2s−1 (see arXiv: 1503.02641 again). The predicted flux and sensitivity is shown below. 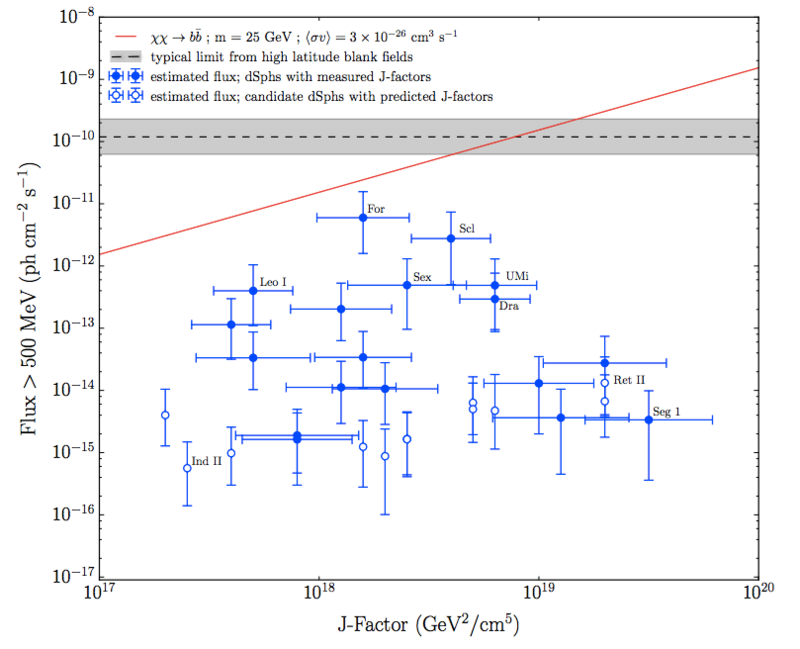 Expected flux versus J-factor (remember J-factor scales with distance). Blue points indicate the predicted MSP contribution in 30 Milky Way dsphs and dsph candidates. The gray shaded band represents the sensitivity for 6 years of the LAT data. 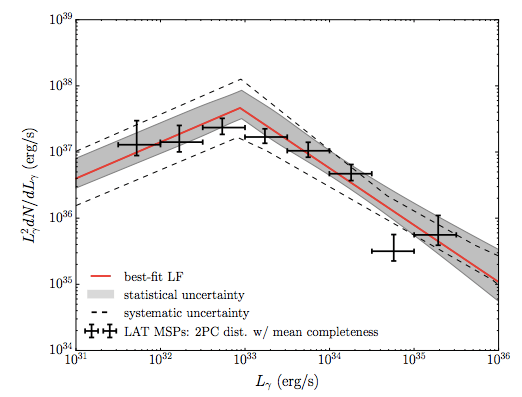 The red curve represents a DM annihilation model that is consistent with both DM interpretations of the Galactic Center Excess and the characteristic spectral shape of MSPs. So all in all, this is good news for dsphs as dark matter targets. Understanding the backgrounds is imperative for having confidence in an analysis if a signal is found, and this gives us more confidence that we understand one of the dominant backgrounds in the hunt for dark matter. Previous PostPrevious Can we measure black hole kicks using gravitational waves?